It's Molly's first day at mermaid school, and there's so much to learn! Follow the mermaids as they count clamshells, recite the A B Seas, and make new friends. They even enjoy story time about children who walk on land! At the end of the day, it's time to sing the goodbye song and head home. 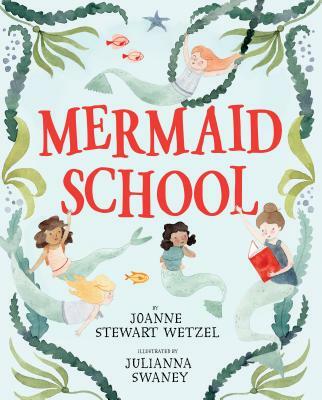 With sweet, rhyming language and a peek into a fantastical undersea world, Mermaid School touches on all the major moments children will experience on their first day. And don't miss the mermaid school handbook in the back of this book for more mermaid fun! JoAnne Stewart Wetzel grew up as an Air Force brat. She became an expert on first days of school by going to nine different schools by fifth grade, and two countries before she finished high school. While she never went to an underwater school, she took synchronized swimming classes, competed on a synchronized swim team, and swam with the Naiads at Arizona State University. She is the author of two children's books on theater, Onstage/Backstage and Playing Juliet. Her first picture book, The Christmas Box, was named a Noteworthy Book for Children by the Bank Street College of Education. JoAnne lives in the San Francisco Bay Area. Visit her at joannewetzel.com. Julianna Swaney is an artist and illustrator living in Portland, Oregon. Visit her at juliannaswaney.com.